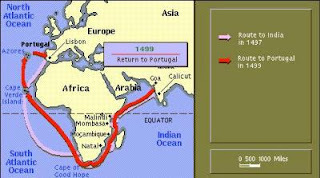 Naval commander Vasco de Gama's 1497 expedition from Lisbon opened a route to India and led to Portugese dominance of the Eastern spice trade. Little is known of his life before he was assigned command of the expedition that left Lisbon in July of 1497. He established a route around Africa's Cape of Good Hope, up the coast of East Africa and finally to Calicut in India. He returned to Portugal in 1499, having lost most of his men while establishing trade posts in East Africa and India. On his second voyage to India in 1502, the new "Admiral of the Indian Ocean" led 20 ships against rival Arab traders and secured military supremacy in Calicut and Goa; the treasures he brought home to Portugal earned him royal favor and even greater repute. Created a count in 1519, he was named Viceroy of India in 1524 and travelled to Goa. While in India he fell ill (probably malaria) and died.